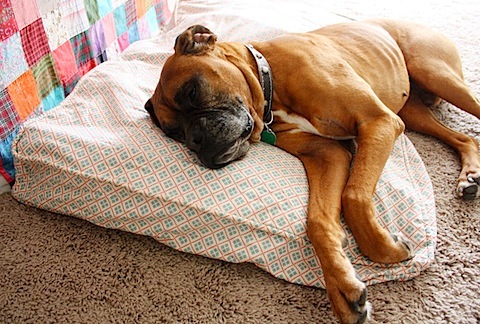 Molly Mutt is way more than just a dog bed company, they have made a revolutionary dog duvet & stuff sack that defines green living for your pet. 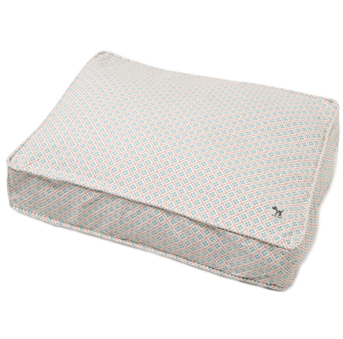 These duvets are a great way to keep old stuff/clothing/towels/cushions from ending up in landfills (Roughly 8% of all landfill mass is textiles), while giving your pup a cool & clean place to sleep! They're easily washable & I absolutely LOVE it that I can place old clothing into the sacks, then cover the sacks with the duvet. When it's time to clean them, you just throw all the items of clothing into the laundry as well as the duvet, it's that simple! These beds are STYLISH & very AFFORDABLE. Prices range from $20-$40 for a small, medium or large. I got 2 mediums, (above you can see my boxer Danny getting cozy on his). I am soooo glad I found this product, I highly recommend it! You can visit Molly's site to view more color choices. 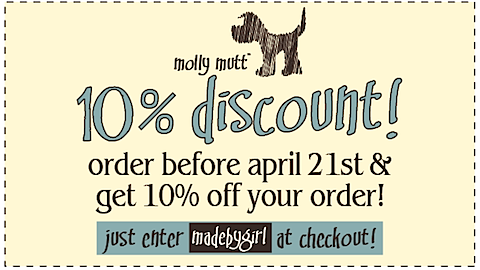 We are so LUCKY, Molly has offered a 10% DISCOUNT to all MadeByGirl readers. Just enter the code below! FOR A QUICK DESCRIPTION ON HOW IT WORKS CLICK HERE. Look at that model! ;)You have an adorable dog! Even your dog is stylish! yes! i love how easy this is...just dump it all the wash, and no struggle to fit the same ornery foam back into the duvet. even better...no foam at all. great find. thanks for sharing. Great post, thanks for the info! Danny is adorable. oh my goodness, i am so glad you found these too, b/c i'm bookmarking them the next time i need a dog bed. i was on a hunt for the perfect one for so long and we finally settled on papasan cushions from pier 1, but when those get chewed up, i'm certainly buying one of these. thank you! it really is a dogs life!! Cute pic of your baby! Great! I love this product. Thanks so much for passing it on. Heading over to check them out. I would buy that i but i want a cute boxer puppy first! 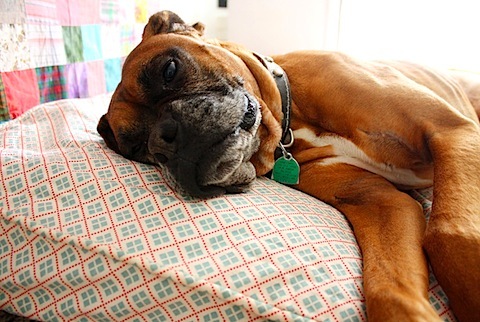 i love love love boxers- what a cute dog! and what a great product! This is a fabulous find! I love the idea behind these, and that they're affordable!! Pet beds are usually sooo expensive -- these are perfection! thank you for posting about this cool product! i have three dogs & am always on the lookout for affordable dog beds (even better that they're green)! Your dog is adorable! These are such a brilliant idea. What a great idea! I'm checking this shop out asap! Yes, that is correct. That is why these dog duvets are great..they don't have all that foam. I think this way they remain CLEANER when you can just throw the old clothes (that is stuffed into the doggie sacks) into the LAUNDRY. So SIMPLE...! Yes, quite affordable...and brilliant concept. I totally agree pet beds can be pricey $$$ and sometimes so plain and generic looking. At least these have some cute options and it's such a smart product. Thank you for posting this!!! We have been looking forever for our lil guy=) well our big guy now (english bulldog) i cant wait to get him one of these beds! Totally GREAT! My lil' pup actually loves to try to curl up in any bit of laundry over his bed. Seems like this is the perfect compromise in our household! And eco to boot! Hoorah! This is such a fun post! I am always looking for new things for my pet. Although...I have a cat...and he's not quite as big as Darla....think this bed will fly for kitties as well? I'm always on the lookout for stylish dog beds and this looks great. I'm heading over there right now. Danny is ADORABLE. I love boxers! so cute! your dog and the products! this is brilliant! thanks for posting. your dog is a sweetheart. And thanks for the idea of making a doggy pillow!! Random pic from my iPhone..
Reusable Shopping & Grocery Bags...Oh so chic! Hello Inside Out...I love you! Shauna & Stephen. The Loft. The Work Studio.